One of the most common conversation topics in NYC is housing. Which neighborhood you want to move to, how small your apartment is, how much your rent bill increased this year, how to avoid paying a broker fee...the list goes on and on. Since I have lived in both low-cost and high-cost of living areas in the past few years, I've spent a lot of time thinking about the pros and cons of both options. For most people, the largest expense in their budget is housing (either rent or mortgage). According to the Department of Labor, Americans spend an average of nearly 33% of their total annual expenses on housing! This means that where we choose to live is one of the most important financial decisions we make in our lives. And it's certainly not an easy decision to make. There is a seemingly endless number of financial considerations, as well as career and lifestyle implications. Not to mention the personal and emotional attachments many of us have to certain places. Is it better to live somewhere cheap and sacrifice the potential for a high-income job? Or is it better to take a higher paying job in an expensive city? Of course, low-cost/high-pay is the holy grail, so if you've already found that, feel free to stop reading. The real answer depends on your specific career and life goals. Let's take a look at some of the pros and cons. Let's take a look at a comparison between LCOL and HCOL saving potential. The goal is to compare two fairly-well-paid young folks starting their careers in two different locations. I have made assumptions for their starting salary, salary growth, rent/housing expense growth, and all other expense growth over the 10-year period. 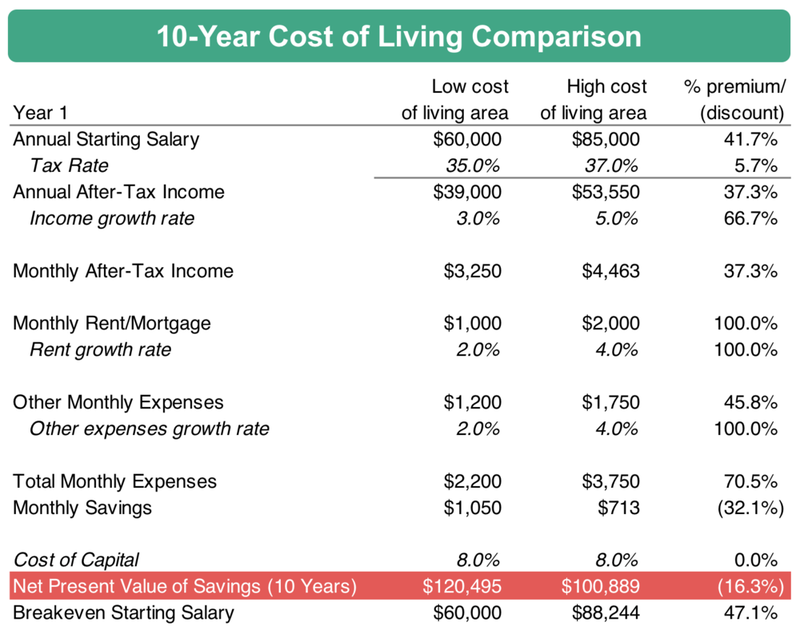 The outcome is a 10-Year Net Present Value of their savings. For simplicity's sake, the growth rates are held constant over the full 10-year period. The breakeven salary shows that a worker in a high-cost area would need to start with a salary of $88,244 in order to earn the same NPV over 10 years. As we can see, in this scenario, the LCOL/low-income earner comes out ahead on the 10-Year NPV. Keep in mind that, these numbers do NOT anticipate any big promotions or lifestyle creep. In reality, high-income jobs often have large pay raises built into the hierarchy that would go well beyond the 5%. For it to be worth living in a HCOL area, you need to start with a high salary, or earn large pay raises along the way. Not too surprising. My financial take-away would be the following: Unless you have the future prospect of earning WELL above the breakeven salary, it might be best to stay in a LCOL area (from a purely financial standpoint that is). Just like any analysis, the result is highly dependent on the assumptions. Garbage in, garbage out, as they say. If you want to play with the assumptions, download the spreadsheet here. What can we do to mitigate high housing costs? I currently live in one of the most expensive cities in the world. I came here for the career prospects and opportunities to earn a big income. So far, that plan has worked out quite well. Frankly, the other considerations around lifestyle, culture, and excitement were not a big part of my reasoning. Having grown up in a relatively rural area, I was drawn to the idea of living in a big city, but it was by no means an actual goal. Over time, I have come to appreciate the cultural opportunities in the city. Will I stay in the city long term? I'm not sure, but probably not. The idea of continually living in a high cost of living area is not extremely appealing to me. Moving to a less expensive area (or maybe an outer borough) seems like a great way to get cost of living arbitrage. What's your plan? What are some creative ways you have saved on housing? Why do you live where you live?